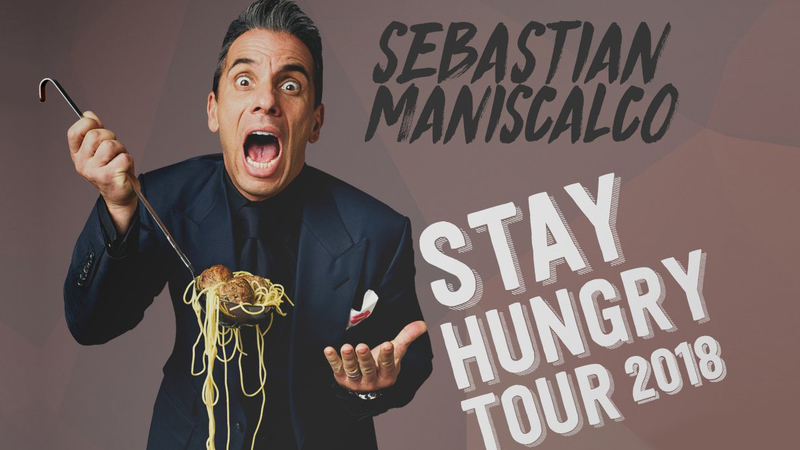 Comedian, actor and best-selling author Sebastian Maniscalco recently wrapped the spring leg of his Stay Hungry 2018 Tour with five sold-out shows at New York’s iconic Radio City Music Hall. People Magazine’s “The comedian’s comedian” broke the historic venue’s record with his appearances ranking him the highest grossing comedy weekend in their 85+ year history. Never one to rest on his laurels Maniscalco is hungry for more. The fall leg of his Stay Hungry Tour beginning on Sept. 8 in Los Angeles will feature over 30 shows across the US and Canada including a stop at the F.M. Kirby Center on Friday, September 14 at 7:00 p.m. and 9:30 p.m.
Tickets are on sale at sebastianlive.com, at kirbycenter.org, at the F.M. Kirby Center Box Office and charge by phone at 570-826-1100.